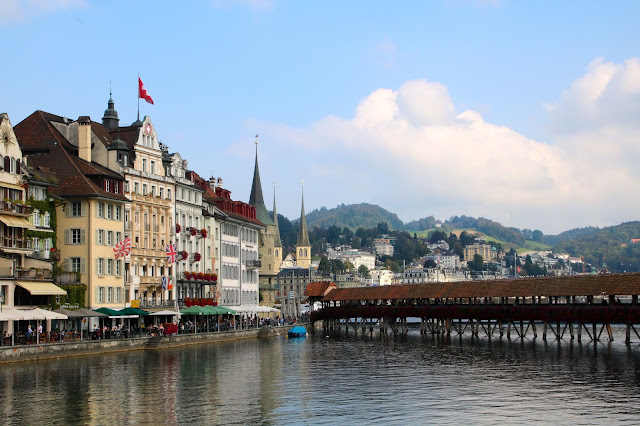 Lucerne is a city in central Switzerland, in the German speaking part of the country with beautifully preserved medieval architecture and sits amid a mountainous panorama right on Lake Lucern. 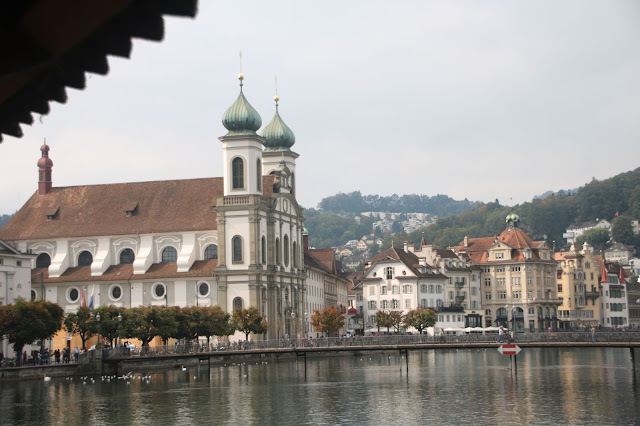 The baroque style Jesuit Church along the river Reuss in Lucern's old town was built in the mid 17th century but the onion topped towers were not completed until 1893. It's striking architecture dominates the south bank of the river. The famous Kapellbrucke or Chapel Bridge was built in 1333 and links the old town (Altstadt) to the Reuss River's south bank. It crosses the river at an oblique angle from the south to the north bank. The Tower and bridge are among the most highly photographed scenes in Switzerland. Majestic swans swam along and underneath the bridge. You can see in this close up the gorgeous hanging flower baskets that bedeck the bridge. Beautiful paintings can be viewed inside the beam structure supporting the roof. 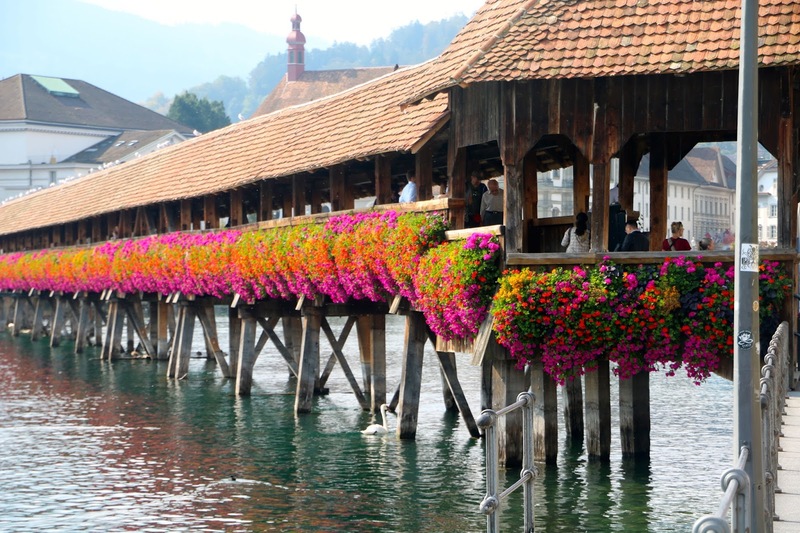 This bridge is considered to be one of the oldest covered wooden bridges in Europe. The Swiss have a long tradition of serving as mercenaries, especially in the armies of the King of France, from the later Middle Ages into the Age of the European Enlightenment. The tradition continues today with the Swiss guards in the Vatican. The Dying Lion was carved out of sandstone in 1820 to commemorate the massacre of Swiss mercenaries defending the Tuileries palace during the French Revolution. 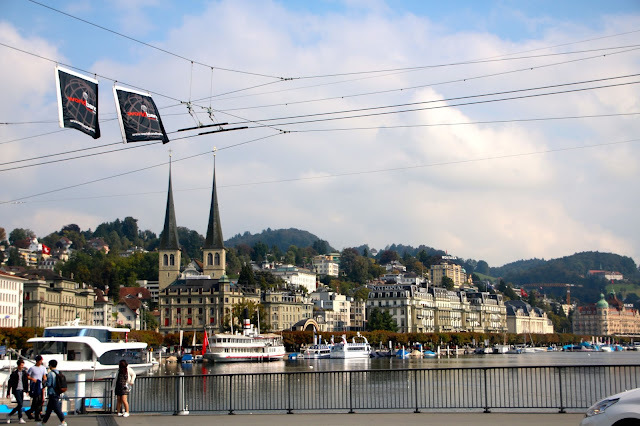 On the second day in Lucerne our optional tour of Lake Lucern was called Pearls of Switzerland. We cruised the lake on this passenger boat to our destination at the base of Mt. Pilatus. The scenic lake cruise was beautiful. At Alpnachstad, the world's steepest cogwheel train ascends to the top of Mt. Pilatus. Mt. Pilatus has an elevation of 7000 feet. Hotel and restaurant at the top where we ate lunch. After a hike the clouds rolled in and we couldn't see the mountain. After a delicious lunch and hike, we rode two sets of gondolas all the way down another side of the mountain. This was our delightful and excellent guide, Christina. 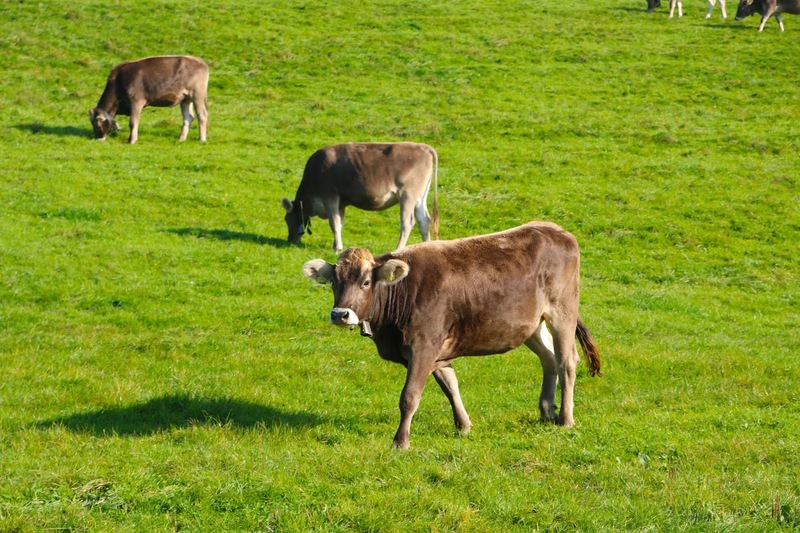 Next at the base of the mountain we rode a van to the Einsiedeln Abbey, an alpine farm and to a cheese factory. 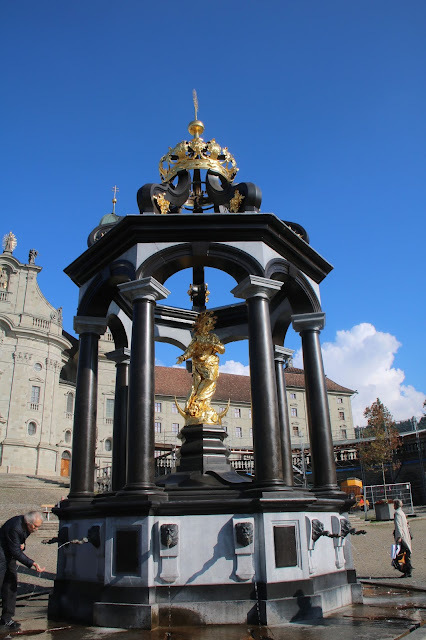 Our next stop was Einsiedeln Abbey, a Benedictine Monastery famous for the Black Madonna. They did not allow pictures inside. The Lady Fountain is in the middle of the square. I was thrilled to see the little girls in native costumes drinking from the fountain. It has fourteen taps and I observed people drinking from all fourteen around the fountain. Google says the fourteen taps equate to the Fourteen Holy Helpers. The tradition is to drink from each tap. How beautiful Bonnie. Such a treat for the eyes. The scenery is beautiful and that bridge with those beautiful hanging baskets full of lovely flowers is amazing. So much history to take in. Thanks for taking us along on this journey. A trip we hope to take in the future. I am so glad you are enjoying your new blog look. Bonnie, what a feast for the eyes in the lovely city of Lucerne. Your post jogs my memory of our visit many years ago. The Chapel Bridge with the hanging baskets is breathtaking...I had forgotten The Dying Lion until I saw your photo! The lake with the surrounding mountains is a postcard photo. We had delicious fondue at Mount Pilates...and the cute girls in native costume drinking from the fountain is perfect! I am so glad you enjoyed this trip and can't wait to see more. Happy Wednesday! Bonnie, first of all, I really like your new look on the blog (kudos if Linda is your fairy!). Your trip photos! Some of them look fake, they're so breathtaking with subject and color! Traveling in the next several years is high on our list of things we want to do. If ever we decide on a Viking River Cruise, I will definitely tap into your plans for lessons learned. Your closing comments sound as though this pre-trip was quite full before embarking on the river cruise, but sometimes I suppose that's how one needs to do it in order to take advantage of the time there. What great experiences and memories! Oh Bonnie, such a fabulous trip! 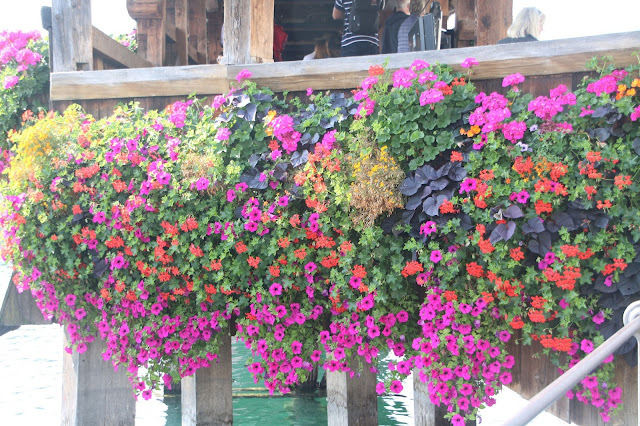 The flower baskets on the bridge took my breath away! Thank you for taking me with you on this dreamy voyage, I enjoy and pour over every gorgeous photo! Bonnie, your pictures are beautiful! You must of had a wonderful time! Thanks so much for sharing your trip with us! I hope that you are having a wonderful week!!! What a wonderful trip. I have been hesitant to do one of these river cruises feeling it would be too much going and not enough relaxing, but wow, you make it so alive, I think this is moving to my "to do" list! Thanks for sharing at Celebrate Your Story! So glad you had such a great time! The scenery and architecture are so beautiful aren't they! what wonderful photos! 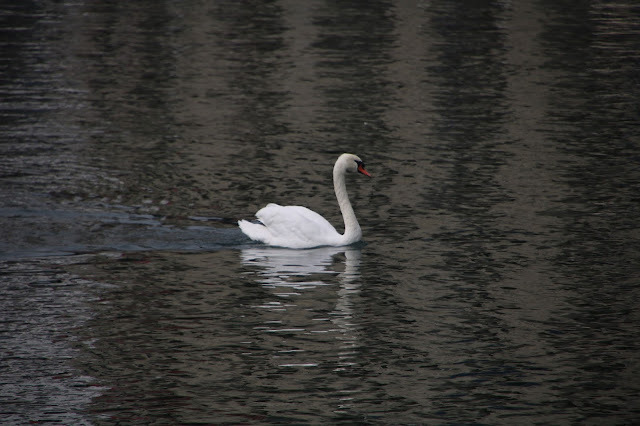 we went to austria over the summer, and these photos remind me very much of salzburg and the alps. i am going to look at your viking cruise post-i really really want to do a river cruise, but it needs to be where i've never been. hope you had an amazing time! Ever since I discovered that my relatives came to America from Switzerland hundreds of years ago, I have had a new found interest in the country but know little of it. So it's just a delight to check things out and see your wonderful photos. I've been considering a cruise and seeing your post makes me only more interested in the idea! This looks like one of the most peaceful places on earth! Hi Bonnie, your blog makeover looks fabulous and I love your pretty picture on the side! Thank you for sharing more pics of your fabulous trip. I was enthralled at the ah I got flower baskets on the bridge! Riding up on the train to 7,000 feet to the top of the mountain and then taking the gondola down, must've been a trip in itself! Making your own cheese must've been a thrill, too, and then bringing it home made for a savory treat, I'm sure. Thanks for sharing with us. This sounds like a trip that I would love! What beautiful photos! 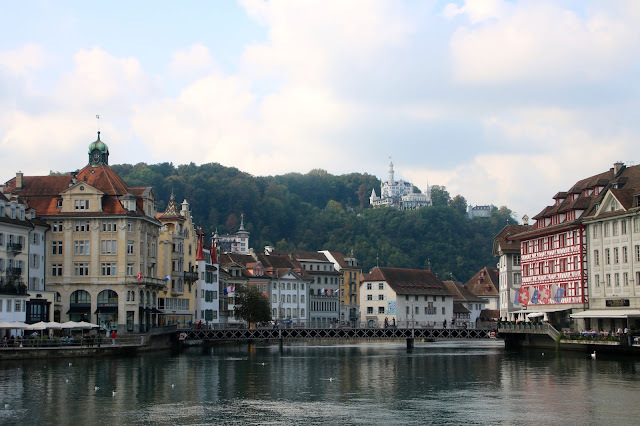 I got chills seeing that bridge again...I visited Lucerne about 25 years ago but with my film-camera, I didn't take too many pictures. What a gorgeous place. You brought back so many memories. If I am not mistaken, I think there was a fire on the bridge after I visited so it's great to see it looks as beautiful as ever! Thanks for joining in the Take Me Away Party! Wow Bonnie, this scenery is spectacular!! Such a beautiful place! I confess to being a tiny bit envious because I've wanted to visit Switzerland for ages. :) When I was growing up, I read "Heidi" and saw the movie on television, and I fell in love with the Swiss Alps. I've always thought it must be one of the most beautiful places in the world. It sounds like you had a wonderful cruise, and I look forward to seeing your next post. Have a great weekend! Your trip photos are so beautiful. You and your husband look like you had a fantastic trip. I agree with Linda (More Fun...). We would be excellent traveling companions, enjoying the same things. I'm glad you mentioned about the paintings inside the bridge. My husband and I were there in 1979 and I was wondering all these years if the paintings were still there. Beautiful pictures Bonnie and thank you for sharing. It brings back fond memories. 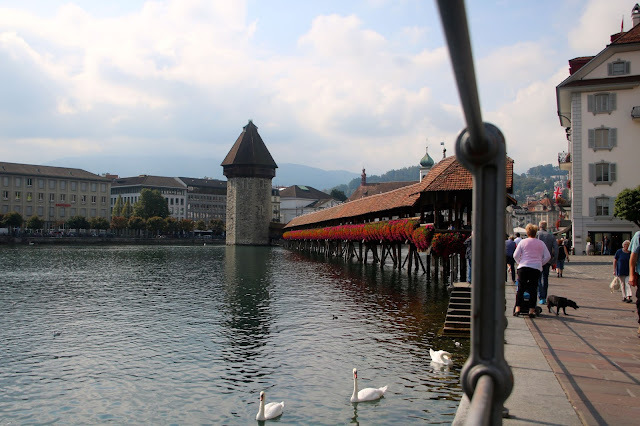 oh Lucerne is so pretty!! I visited there for the first time this past September. I couldn't believe how pretty it was! I found you through the Monday social party! Wow, the first time I saw the Chapel bridge in your wonderful article, I thought; If I could make my driveway look like that? I'd be in heaven every day! If you ever go again I want to hide in your suitcase, what a stunning and historical place. Definitely on my bucket list to visit after seeing your photos. This is the greenest of the green and breathtaking beauty at every turn. You must have been in awe and your spirit surely was refreshed! Your trip sounds wonderful and I so happy that you and your husband are able to travel like this. Thank you for the little trip to Switzerland tonight! Oh my, what a beautiful views and the homes are gorgeous. What a great trip and I am so happy you shard at Dishing it and Digging it link party. Wow, you certainly are blessed with an eye. 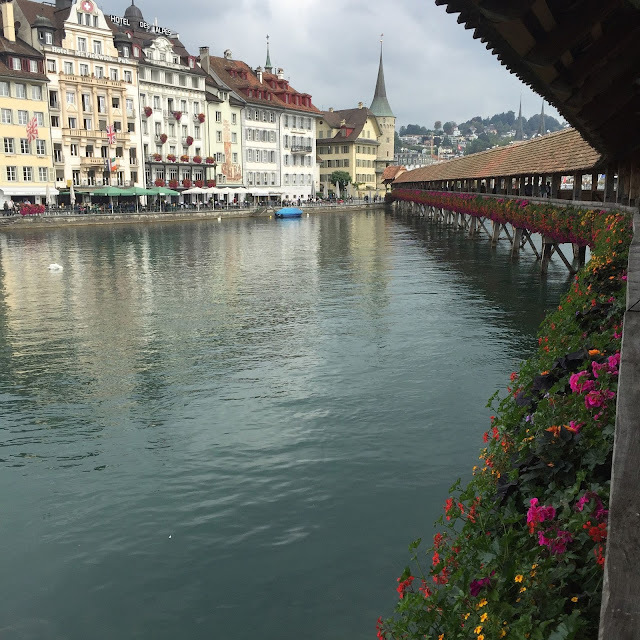 Your Switzerland trip pics are beautiful. It must have been an amazing experience. I remember being in Germany as a young GI, and being awestruck with the difference of another country.